If you have ever wanted to fill a large area of your embroidery, but wanted to skip the fill stitches, appliqué may be just the thing for you. It's easy and gives your work beautiful variety. Traditionally in embroidery, you would use stitches like satin stitch, long and short stitch, chain stitch and others to fill an area. They each have their own look and they do the job. But it's good to have options. Appliqué is often much faster than stitching all those stitches, but it also gives you a way to add different texture or pattern to your embroidery. All you have to do is choose an area of your pattern that you want to fill and replace it with fabric. You can do just one portion of the design or many of the spaces. Then add outline stitching to complete it! There are lots of ways to apply fabrics to your work, including needle turn and short-cut turned appliqué. These are especially good for embroidery that gets washed more often. 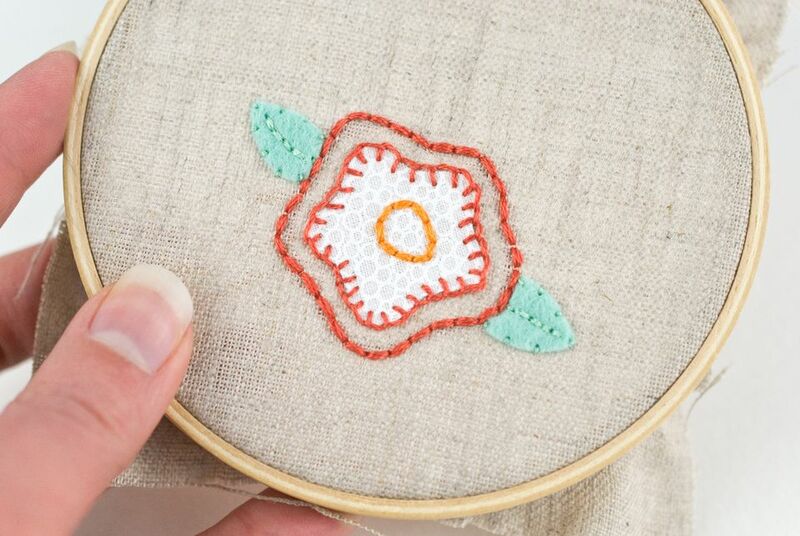 But for the rest of your embroidery, here are two methods that work easily. This method keeps the edges of the fabric raw (not turned under), which can lead to some fraying. However, by attaching the pieces to the fabric with fusible web, it prevents most of the fraying while holding the piece in place. To prepare your pieces, iron paper-backed fusible web to the back of the appliqué fabric. Trace the part of the embroidery that you want to fill and cut out the fabric piece. If embroidered details will go on the appliquéd area, you can trace those right on the fabric with a fine pencil. With felt appliqué the edges are also raw, but felt doesn't fray so there is less to worry about. Felt also grips to fabric more, so it's not always necessary to fuse it to the fabric (although you can). If you are working with many pieces, it may be helpful to tack them to the fabric with a drop of fabric glue. To prepare your pieces, make an extra copy of the embroidery pattern and cut apart the pieces you want to fill. Use those as a template to cut out the felt pieces. Note: The pattern shown in this tutorial is the large flower from the free Give Thanks embroidery pattern. To attach fusible appliqué piece, iron the pieces to your embroidery fabric. If you are using a water-soluble pen to mark your pattern, you should iron your pieces before marking the pattern to avoid heat-setting the pen. Once you iron the pieces onto the fabric, they will not be repositionable, so be sure they are exactly where they should be to match up with the pattern. Embroider around the pieces with a stitch that will outline your design. Stitches that go through the appliqué are good because they help secure the pieces. However, you can stitch only through the embroidery fabric close to the applied fabric piece. This example uses blanket stitch. Quilting cotton comes in so many designs, so this is a great way to add patterns to your embroidery that would be difficult to achieve otherwise. For example, if you are embroidering a girl in a dress, you could use floral fabric to fill in the dress. To attach felt pieces or other non-fraying fabrics, hold or glue the pieces where they belong in your pattern. In this method, you can mark the pattern on your embroidery fabric first. Stitch around the pieces with whip stitch, coming up from the bottom just under the appliqué piece, then going down through the edge of the felt. Use matching embroidery floss and only one or two strands so your stitches don't show much. You can also use contrasting thread and more strands if you want to make it stand out. Felt is a good way to add a different texture or dimension to embroidery. Because you won't be able to trace additional embroidery details onto the felt, use the tracing paper method to add those (or freehand stitch small details). When you have the appliqué pieces stitched in place, add the rest of the embroidery, stitching as usual. By combining appliqué with your favorite embroidery methods, you'll be able to create beautiful designs in a new way. You'll save some time and give your stitching a unique look!